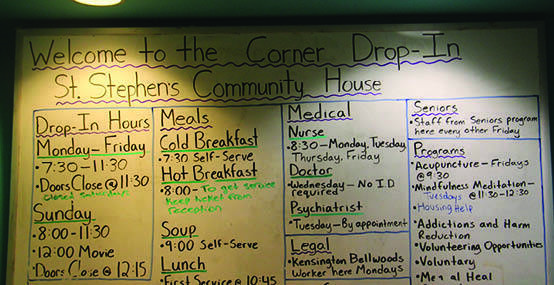 We serve over 200 participants through the Corner Drop-in each day. While some people come for the daytime shelter, nutritious hot food or just to meet and chat, others take advantage of primary health care services from on-site nurses, doctors and psychiatrists. We also provide information and help finding affordable housing, mental health support, voluntary financial trusteeship, substance use counselling, workshops and activities. Thanks to the countless volunteers and landlords who participate in the program, our Corner Drop-in participants are able to make a fresh start. You can find other drop-in services across Toronto on the Toronto Drop-in Network.